Let us start off by saying, the relationship between grave robber and grave digger used to be a whole lot worse. Young Gus can attest to the few nights when a couple of unskillful wretches figured they’d be the next Burke and Hare, breaking into Quiet Side early into the morning in hopes of raiding a few of the freshly buried. Often they’d get caught and end up with a backside full of rock salt or worse, waiting for the ambulance or the police to arrive. It was a rare individual who would spoil a good day’s work in hopes of scavenging the few bits of material goods the departed wished to entomb along with their decaying remains. T’was even rarer that such a person was right evil; most, clumsy and ashamed as they were, were good but desperate folk who simply ran out of other options. As the years gone on, the night guardsman trigger finger became less prejudiced. This isn’t to say that security became lax or that a near spotless record at Quite Side suddenly became a tarnished cover. We have pride in our work and the loyalty to our customers in mind. But, as the days have gotten darker and the harvest less bountiful, certain understandings came into play between the two rivals. Don’t take this as some kind of condoning pardon issued for any of you who think it’s an up and coming vocation to take a shovel to the next graveyard. Not all members of our union are understanding. You will get arrested and possibly shot. But, when one of the tyrant shipping executives decides to load his casket with the baubles of a life lived for the bottom line, one can’t be too angry at the discovery of an exhumed corpse the next morning. Sometimes, a body isn’t buried too deep, knowing full well it’ll have to be covered up again. Other times, we have to be diligent against such invasive efforts. Some things get buried for a reason. So we speak of the Grave Robbers Union Local 666 this time around. We put them in, they take them out. It’s a circle of life, a bit of recycling. As the resources dwindle, we’ll all be digging through the dead, soon enough. 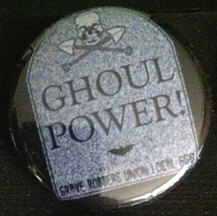 Grave Robbers Union (GRUL666 from now on) specializes in apparel and accessories for the horror enthusiast, ranging from buttons, belt buckles and the above t-shirt. 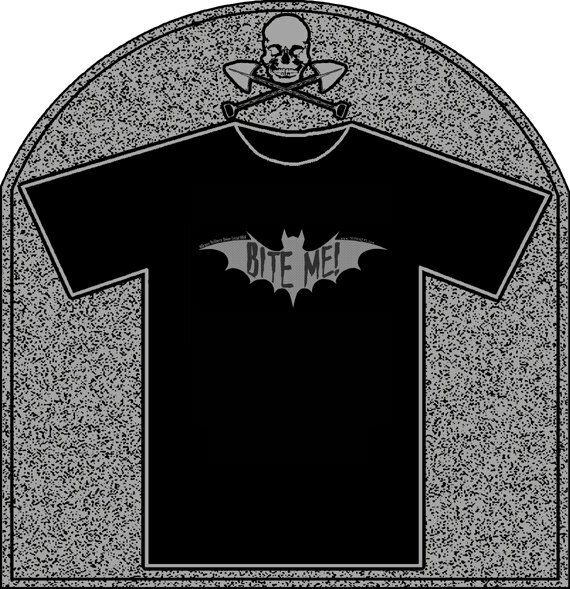 A pre-sale for you vampire fetishists or bat-lovers out there, this shirt invites the world to pony up and chomp on certain tender spots, whether they are above your waist or below. Perhaps you’re into this ‘bite club’ mentality? Or maybe you just like telling the world to kiss off? 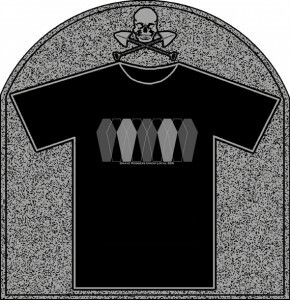 Either way, this shirt is currently on presale. We personally enjoy this ‘coffin argyle’ design and hope that GRUL666 branches out into footwear so that we can see this ingenious pattern (in varying colors of mahogany, dried sienna and midnight black) on socks in the future. 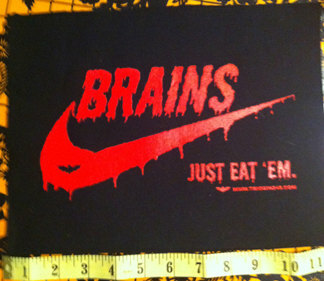 It’s a clever design that we hope doesn’t remain on this t-shirt. It’s one of those near realities, where we are on the cusp of an event. Soon, you might see ladies rocking knee-highs of this pattern at your local rockabilly show or perhaps on their arms as wrist warmers. You’re witnessing history here. Be glad. 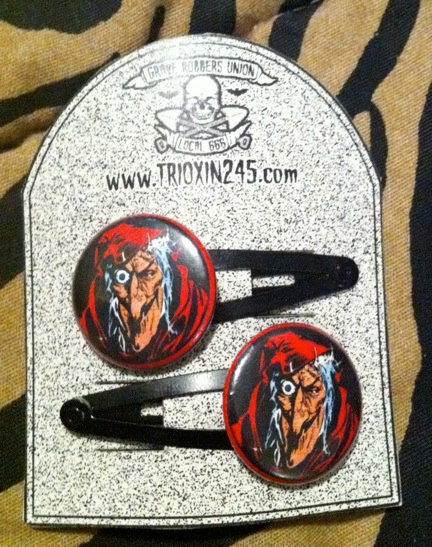 In addition to the t-shirts, belt buckles, buttons and more that you’ll find at GRUL666, there is a plethora of hair clips available for your everyday (is Halloween) needs. One such example is this retro ‘Misfits Fiend Club,’ demonstrating a logo that isn’t the now world famous ‘Crimson Skull.’ Anime influenced or no, we can’t really know much of the origin of this image except that it’s NOT the Crimon Skull and for that alone, it deserves your attention. Perhaps wearing this goth/punk will attract the batcave dweller of your dreams? Or maybe it’ll make your hair look neat? Either way, buy. Sometimes you never really know when you’re robbing a grave. Strange Jason remembers a time when as a youth, a friend of his family passed along a large cardboard box full of second hand comic books. For every superhero, there was one horror title. X-men were evenly matched by House of Mystery, Superman with Tales of Suspense or the Boris Karloff offshoot. Perhaps you share a similar affliction or would like to demonstrate some solidarity to the old printed horror, the likes of the button hair clip seen here. Either way, we don’t judge you. Parody aside, you sometimes just need to demonstrate a basic need. It might not even be for mere consumption but for a higher diet of conversation. Mainly, though, this is about consumption. Eating your fill and continuing on. It’s clever. It’s retro. It’s a patch and that’s all you really want to know, isn’t it? Find more about GRUL66 on Facebook – (www.facebook.com/grul666) as they are quite active in their local community. Friend/Like them and you’ll be privy to all their secret dealings. Last weekend, they were giving away gifts. You want free gifts, don’t you? Well, you might as well follow them on Twitter over @grul666. 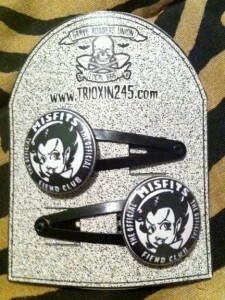 Their website – www.trioxin245.com – will redirect you to their Etsy store for now but an official website with new products is forthcoming. Until then, go to www.etsy.com/shop/grul666 for all your needs. Keep an eye here this week for a bonus collaboration t’ween robbers and diggers and always, come back in a week for another edition of Tuesday uEtsy.